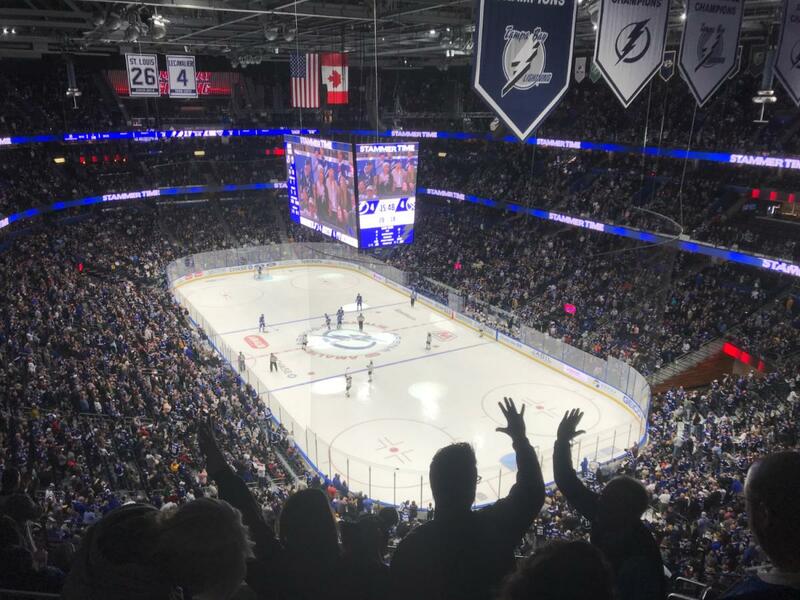 The Lightning outlasted the Buffalo Sabres 5-4 in a thrilling back-and-forth affair Thursday night. Buffalo came to town riding a ten-game winning streak that shot them up to the top of the league, meaning it was an early season battle for possession of first place in the Atlantic Division NHL. Hopefully this game is a sign of things to come because, wow, that was an entertaining hockey game. It had all the elements of the playoffs: multiple lead changes; huge momentum swings; intense celebrations; big (and questionable) hits; and even a semi-line brawl. The only way to tell for sure that it was not a playoff game was the absence of “2019 STANLEY CUP PLAYOFFS” lettering inside each blueline. Something needs to be made clear: Buffalo is not one of the top teams in the league. It only takes a quick look at the numbers to realize that their play over the last eleven games is not sustainable. Of the ten straight games they won, seven of them went to overtime, and three of those went to a shootout. They won by more than one goal in only one of their three regulation wins, a 5-2 victory over the Flyers. Their team save percentage was around .930, a whopping 21 points above the league average, and they shot around 10.5%, also above the league average. Their return to Earth is inevitable. However, the only stats column that matters is points, and a look at those stats for both teams meant a tantalizing matchup was in store. The intensity was evident from puck-drop, and before the game was three minutes old the Bolts had all ready amassed eight shots and a Dan Girardi (?!) goal for a 1-0 lead. That lead lasted about six minutes, as Zemgus Girgensons and Sam Reinhart scored within two minutes of each other to make it 2-1 Sabres. Alex Killorn tied the game less than a minute later, and Nikita Kucherov scored on a 3-on-1 to give Tampa Bay the 3-2 lead heading into the intermission. Paquette was referring to the final seconds of the first, where tempers flared and he dropped the gloves with not one but two Buffalo players. Several punches were thrown and everyone on the ice had a stranglehold with an opposing player. Earlier in the period, Buffalo captain Jack Eichel threw a cross-check into the back of Lightning defenseman Ryan McDonagh, sending him into the boards and out of the game. Paquette’s line retaliated, highlighted by Ryan Callahan blasting Casey Mittelstadt in open ice. The scrum at the buzzer was a natural escalation of the physical play on the ice, just like a playoff game. Players echoed that feeling after the game. Buffalo tied the game at the in the second through Sam Reinhart, and took the lead two-and-a-half minutes into the third on a Tage Thompson goal. Steven Stamkos would tie it on the power play a few minutes later, and Cedric Paquette fired home the game winner with about five minutes left. For those keeping score, that’s four different lead changes and neither team ever led by more than one goal. Again, Buffalo is not quite as good as their record indicates. They still have a ways to go before they reach true contender status. But they are a young team and are only going to get better. Lightning fans and Sabres fans should be excited by that, because the drama on the scoreboard combined with the physical edge makes for great hockey, and hopefully they play more games like this for years to come.